When you need a new sail, there are lots of options in the used sails market. Measuring sails for replacement will give you the information you need to purchase replacement. You will need to know the dimensions of the sails that you have or the rig dimensions. Either one will work and here we show you how to come up with the dimensions you need. There are basically two ways to get the information, first to find out the measurements from data found in various places. The second is to measure the sails you have or measure the mast and rig of your boat. When a yacht designer specifies the rig dimension he uses these dimensions. 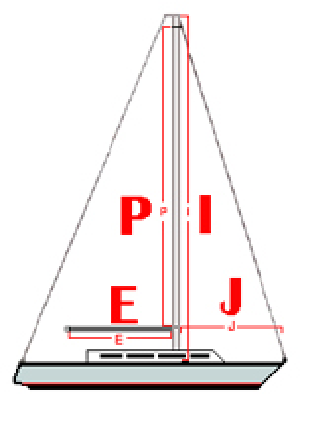 These dimensions are then used by sail makers to design the boats sails. Discovering the I, J, P and E for your boat. To figure out how big your headsail is or needs to be you need to measure two basic dimensions. They are the Luff and the LP or Luff Perpendicular. The headsail is a basic triangle and two dimensions is all that’s needed. There are other details but these dimensions define the size. Here we look at measuring the sail you have and want to replace. If you don’t have an existing sail to measure you will need to measure the rig. All three corners of the sail have grommets where you attach the headsail halyard, the tack fitting and the sheets. Measurements are from these points. So if you already have a sail that you want to replace, measure the luff length between the head and tack grommets and the LP (luff perpendicular) from the clew to the luff perpendicular to it. This is the maximum length you can use. Make an allowance for measurement accuracy and stretch. You need space for the sail to stretch under halyard tension. 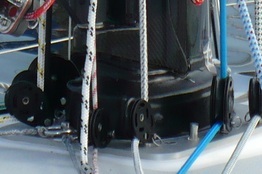 The red line is the distance from the head fitting on the top furler and the tack fitting on the bottom drum. Attach a tape to the top swivel, just as the sail would be attached. Hoist the top swivel up the mast with the halyard. 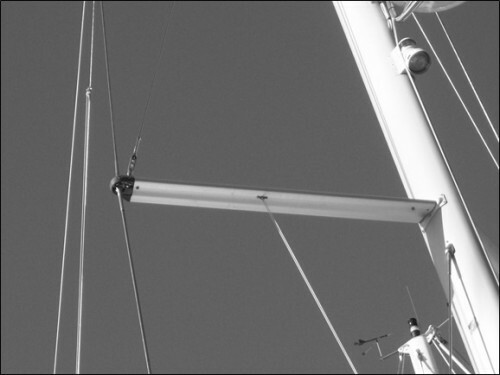 When the top swivel is at its upper most point, lock the halyard. With the tape measure down to the tack fitting on the bottom drum. To measure the LP you can tie the end of a tape measure to the headstay. A loop of line can be tied around the headstay and then attach the halyard to the loop along with the tape measure. Now you can hoist the tape up the headstay. Pull the tape measure to the turning block for the headsail. Hoist the tape measure up the headstay until it lies perpendicular to the headstay. See diagram 1. Typically LP are designated as a percentage of the J measurement. This is what is called the overlap of the headsail i.e. how far the headsail overlaps the mast. Often you will see 103% or 130% or 150%. The 150% is generally the largest LP. 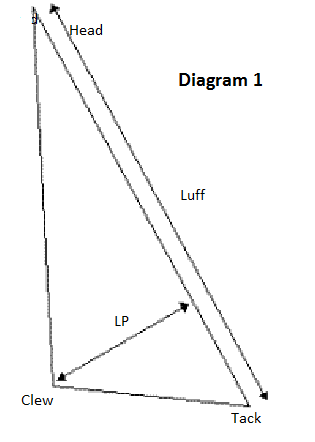 Mainsails are easier to measure as there are fixed measurements P and E, which are the luff length and the foot length. 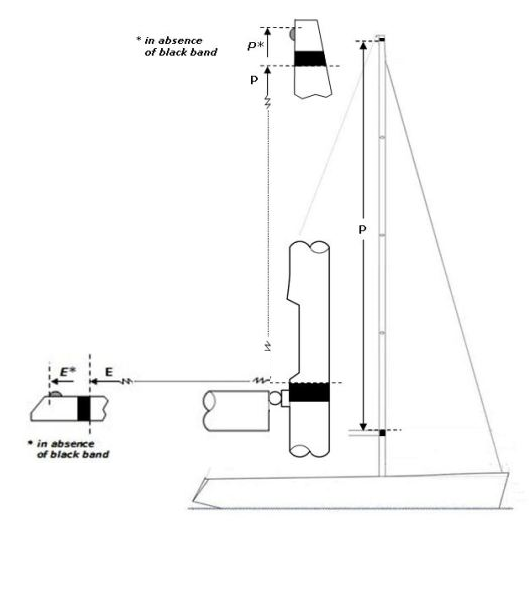 The diagram courtesy of ORC shows a typical mast and boom with black bands. 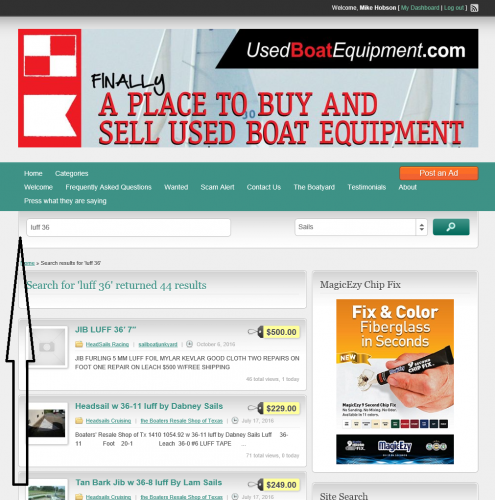 Type “luff 36” into the search box and you will get the listings with luff lengths with 36 feet and x inches. Chose the sail that fits. at Donation programs take boats and use them in their in-house programs for a while before eventually selling them on. These Non Profit organizations will evaluate the boat and offer you a Tax Credit. 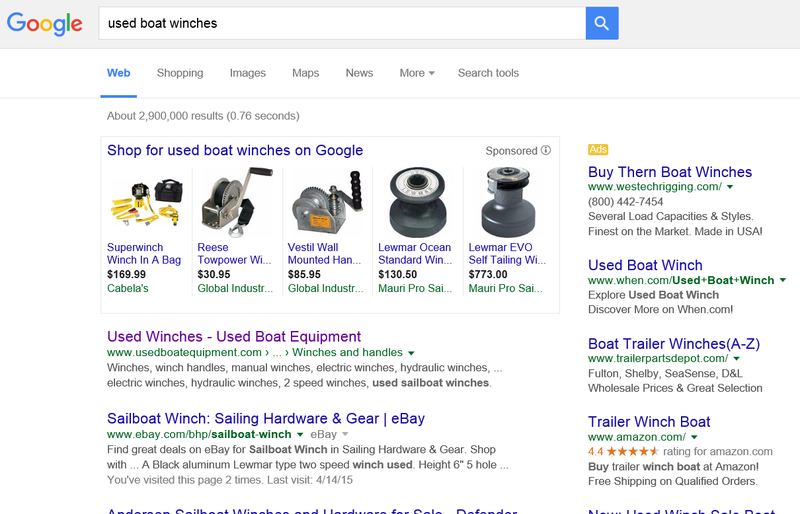 Donating your boat doesn’t make sense if a Tax Credits doesn’t work for you. There are plenty of donation programs from Non Profits or 501Cs. Check your local area or Charity to see if they have a Boat donation program. How do Boat Donation Programs Work? This is from the Block Island Maritime site. Boats donated to a charity can qualify for a significant tax deduction. An individual or a couple filing jointly are allowed to deduct up to 50% of their adjusted gross income as charitable contributions on their Federal tax return. This would include the appraised value of a boat. Most States also recognize the charitable contribution of boats but State rules can vary and a tax professional should be consulted with regard to an individual’s specific State. When a vessel is donated to a 501(c)(3) non-profit organization, several conditions must be met in order for the donor to deduct the appraised fair market value of the vessel. 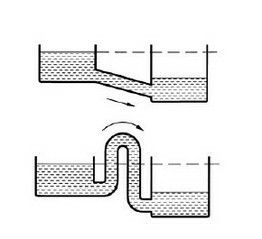 Vented loops or Anti-Siphon Valves: are inverted U-shaped pipes with a vent at the top to let air escape. 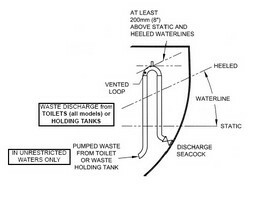 Vented loops are found in toilet discharge lines or in systems which are mounted below the waterline. 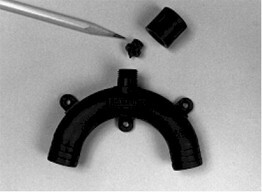 Vented loops are a necessity for many marine systems to prevent back siphoning . You need vented loops (anti-siphon valves) as part of the engine exhaust system, or plumbing for bilge pumps, or the marine head. The reason you have them is to stop a siphon or backflow of water in the system. With a siphon, the water can travel the wrong way and in the case of a marine head the water can go back into the toilet and overflow it. With an engine the water can flow through the exhaust into the engine causing much damage an flooding. Vented loops are simple devices and very rarely go wrong, but when they do the results are catastrophic. The boats potentially sinks! Mount the vented loop so it will remain above the waterline at all heel angles. Clean the anti-siphon valve regularly to keep it functioning. I remember siphons from draining a swimming pool as a kid. The pool was on top of a slope so using the principle that water wants to flow downhill. A hose was filled with water and both ends blocked off. One end of the hose is placed in the pool and the other down the slope. Both ends are now unblocked and a siphon is formed resulting in the water flows downhill fully draining the pool. So how does a siphon work in a boats plumbing system or exhaust system. The diagram right from Jabsco demonstrates the problem. In top diagram you can see that water will flow into the lower bowl. In bottom diagram the hose has a loop. In this case the hose is filled with water and a siphon is created, so water will still flow into the bottom bowl. Now if a vented loop is added at the top of the loop the siphon is broke and water will not flow to the bottom bowl. How does a Vented Loop fitting work? A vented loop is fitted with a one way valve. This permits water to be pumped through the loop. However when the pumping is stopped and no more water is pushed past the vented loop, air is let into the pipes and the water level drops away from the loop on both side, thus preventing a siphon from occurring. The vented loop allows air in but not out. Detail of a vented loop showing the Duckbill one way valve. The valve allows. Forespar supplied this diagram of how the vented loop works. Obviously the raw water or sea water intake of any boats water system is below the waterline. Also in many cases so are the boats toilets, heads, engines, generators etc. This requires a through hull fitting or seacock to be added to the raw water intake. In case of any failure in the hose or any other part of the water system. The seacock can be shut off to stop water incursion in case of an emergency. However during operation of the boats systems, the seacock is left open. This allows for water to enter the inlet if a siphon occurs. Once the water comes in, a toilet or head can flood. Marine Heads are often installed below the waterline. Therefore its important to have a vented loop. Most often this is installed on the discharge side of the heads plumbing system. 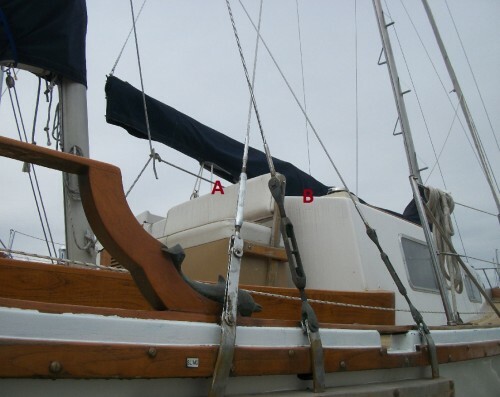 See the diagram courtesy of Jabsco showing the vented loop installed above the boats heeled waterline (if its a sailboat) by 8 inches minimum. 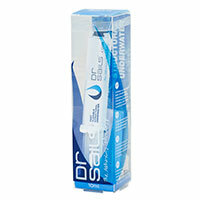 If you add or have a Vented Loop in the discharge side of the toilet, add a breather, to vent odors overboard. I have seen heads & holdings tanks that have vented loops but the vent breather is not plumbed overboard and odors linger below. The picture left shows a Vetus Vented Loop with a overboard breather as part of the package. In an exhaust system without an anti-siphon valve, when the engine is shut down, raw water continues to siphon into the exhaust system until it reaches the same level as the outside, i.e., the waterline. 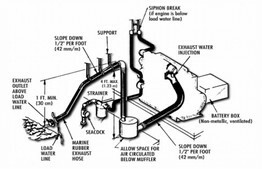 If the engine is installed below the waterline the water will flow back up the exhaust pipe and into the engine itself. This can be avoided with a vented loop. The vented loop, or anti siphon breaker is a Loop with a small valve that closes under raw water pump pressure, when the engine runs, and opens when the engine stops, allowing air into the pipe, thus preventing the water from siphoning. The vented loop which was installed in the seawater cooling system, by the boats manufacturer will prevent a siphon from building. You should find out where it is and add into your yearly maintenance schedule. Check that the valve is clan and working. Look at your boats systems and find the location of the vented loops. Note their position and add them to maintenance schedule. These should be inspected to make sure they are clean and the valve is seated properly. If the valve is blocked it wont prevent syphoning. 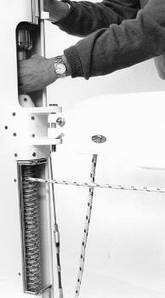 For servicing procedures look at the Groco installation and service manual. For servicing of vented loops, Include them in your yearly! maintenance program that include all seacock’s and through-hull fittings. Seaworthy Goods based in Florida have come up with an Engine Panel visor. The Engine Panel Visor is a custom cover to protect your boats engine panel from water and damage from feet and other objects that can damage the gauges or even start the engine. The visor is hinged at the top and is made form clear lean. You have full visibility of all the instruments yet the instruments and start key are protected. Seaworthy had already been producing some custom engine visors to fit some types of panel, but now have the multi panel hinged Lexan cover. PanelVisor™ protects engine panels from sun, knocks & water. This multi-panel style cover (MP-8.5) fits any panel up to 8½” across and 6½” high. The clear cover protects against sun, rain, wash downs, and clumsy kicks. (It’s made of tough UV-resistant Lexan with a StarBoard frame and marine-grade fittings.) 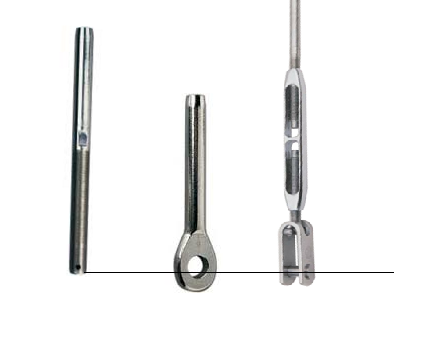 To provide maximum access to keys and controls, the friction hinges hold at any angle. Everything for installation is provided except the drill — stainless hardware, positioning tape, and even the drill bit. We also designed something we’ve wanted for a long time — protection from locker knocks. Exposed wires and gauges always get hit by life jackets, sail bags, and other salty items. The damage varies from broken connections to corroded gauges. The optional shell provides strong protection from all those locker knocks. Installation is a breeze because it fits onto the same stainless hardware provided for the cover installation. The shell is made of ABS plastic with an amply cutout for cables to fit through. These PanelVisors™ are custom designed to attach onto specific model instrument panels using existing holes and provided hardware. They’re made of Lexan XL102-UV, with UV protective coating on both sides. Tachometer and indicator lights are clearly visible, with easy access to controls and switches. You are getting water in the bilge and you track it down to the propeller shafts stuffing box (also called stern gland). The stuffing box houses a seal which the prop shaft passes through. Some rudder stern glands work the same. Most stuffing boxes have an adjusting nut which compresses the packing material, controlling the rate of drip. If adjusting the packing does not fix the leak you may have a damaged or worn shaft. If it’s in any way irregular, pitted, or damaged, the packing will be torn up each time the shaft rotates. 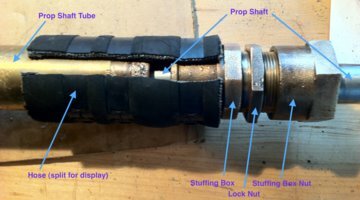 If this is the case you can: Replace the shaft, or use a longer or shorter stuffing-box hose to move the location of the packing over to a smooth section of shaft. 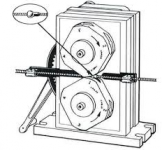 1 This article looks at the stuffing box and its maintenance. What does a stuffing box look like? 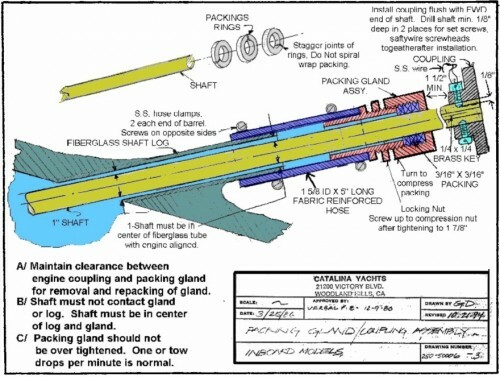 The diagram courtesy of Catalina shows a typical propeller shaft installation with the shaft log and stuffing box. The shaft log is a tubular passage through the bottom of the boat where the shaft passes on its way from the engine to the strut and cutlass bearing. The stuffing box assembly attaches to the shaft log with a length of hose and a pair of hose clamps. Water is required to lubricate conventional packing. A properly adjusted stuffing box won’t drip when the shaft is idle, but 2-3 drops/minute when the shaft is turning. Most DSS units have a small barb fitting on the graphite flange where a hose can be connected to ensure that water is always present. From the fitting, the hose runs either to a place high above the waterline, or, in the case of higher speed vessels, into the engine’s raw-water cooling system. This fairly simple procedure can be done with boat in water. This picture of a cross section of a shaft gland come to us thanks to the Alberg 30 class site. Notice the “locking nut” and the “adjustable stuffing box nut” in the picture. Conventional stuffing boxes require water to lubricate the packing. Often you will see water dripping from the box. A properly adjusted stuffing box will have no drips when the shaft is stopped, but 2-3 drops/minute when the shaft is turning. When adjusting the stuffing box keep in mind that; if the adjustable stuffing box nut is too tight you will burn the packing which can end up with a damaged shaft. If your stuffing box leaks more than 8 drops a minute, it needs adjusting. 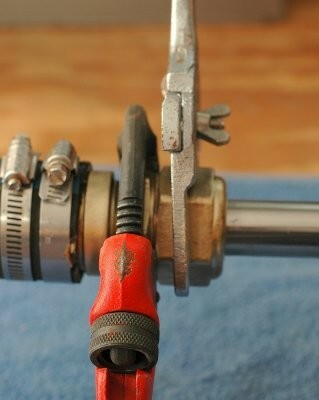 Two pipe wrenches are the tools needed for adjusting the stuffing box. Start by loosening the locking nut, this frees the adjustable stuffing box nut. As you tighten the Stuffing Box nut check for leaks while the props are idle. If you notice any dripping tighten the Packing Nut a bit more. Once you stop the dripping tighten the locking nut. Now you are going to need to check the drip rate with the engine running. You can do this with the engine engaged in forward and the boat securely tied in the slip. If it is more than two drips per minute loosen the locking nut, then tighten the adjusting nut slightly. Access to the engine is critical and you should be aware of the shaft turning. It’s safer to take the engine out of gear, while you’re adjusting the nut. When the drip rate is one or two drops per minute, stop the engine then tighten the locknut. Final check; As long as the box isn’t dripping too much and isn’t running too hot, you are in the correct range. While you’re at it give threads and nuts a coat of corrosion blocker. Ideally to do this project you want the boat out of the water. It’s possible if you’re organized to do a short haul (boat hangs in slings) at lunchtime or overnight. If you don’t have the option the packing may be replaced with the boat in the water, but water coming in may be a bit disconcerting. If you’re organized the amount of water coming in can be handled by the bilge pump. To begin; Loosen the Lock Nut by placing one wrench on the Packing Nut and the other wrench on the Lock Nut. Using two wrenches helps prevent twisting and damaging the shaft log hose. Removing The Old Flax; Once the Packing Nut is unscrewed from the Stuffing Box, use a pick and carefully remove all of the old packing. It can be difficult to see if all the old flax has been removed and so a dentist’s type mirror can be useful to inspect the Packing Nut. Careful not to score the Packing Nut or shaft. Next installing the new Flax Packing. A common mistake is winding the new packing around the shaft as a continuous piece. This will not seal properly, instead It must be installed as a series of stacked rings. Usually 3 rings. This requires cutting the packing into lengths that just encircle the shaft with ends touching. See section 4 materials for length and size. requires patience to get the packing right. Start by wrapping the first piece of flax around the shaft snug up against the stuffing box, ensure the 45 degree ends touch. Now slide the Packing Nut up against the flax carefully forcing the flax into the Packing Nut. Once the flax is as far as it will go into the Packing Nut, use a flat blunt object to carefully pressure the flax into the nut. Now install the next flax ring the same way and make sure the 45 degree joint does not sit in the same plane as the previous ring. When all of the flax wraps are installed in the Packing Nut, begin to thread the Packing Nut onto the Stuffing Box. The Packing Nut will put pressure onto the packing and if it’s too full you may not be able to get the threads on, if you have it right it may take just a little pressure to get the threads. Nest apply more hand pressure to begin to tighten the Packing Nut. When you are max hand pressure, remove the nut and look to see if the flax is seating properly. If it’s OK re-install the Packing Nut and tighten snug using a wrench, back off slightly to ensure that it is not too tight when you first turn the propellers. Now thread the Lock Nut snug against the Packing Nut and tighten using your wrenches. The Stuffing Box Packing is woven flax or synthetic, squared-off rope like material. There are two main types of material. 1 Traditional Flax packing; has been around a long time. This grease based packing is very reliable, however if the stuffing box gland nut is over tightened, the flax packing can heat up causing high temperatures and possibly damaging the shaft. 2 Modern Graphite packing; is an excellent a lubricant, reducing the chance of burning the shaft. It is very expensive however. Ensure you have the correct size flax packing for the stuffing box, if the old packing is relatively intact you can measure the thickness. 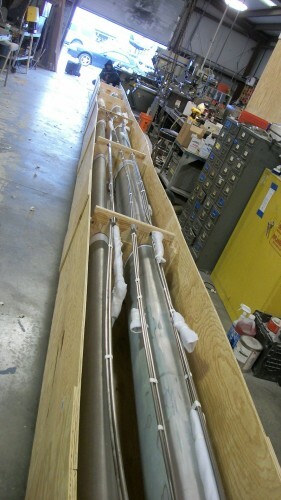 The shaft diameter and type of stuffing box should reveal the correct size of the flax. Next you should plan on 3 full wraps of flax around the shaft to fill the Packing Nut. Now you need to cut the flax to the proper length to fit completely around the diameter of the shaft. Lengths can be cut on the exposed shaft on the outside of the hull if possible. Cut the flax at 45 degree angles like a scarf joint. This will allow the ends to mesh together once the Packing Nut pressure is applied. If you can’t use the shaft you can use a piece of pipe the same diameter as your propeller shaft. Suppliers; Stuffing-box manufacturer Buck Algonquin (www.buckalgonquin.com). Tools required; a pair of spanner wrenches or pipe wrenches. Razor knife or razor blades to cut the flax. You will also need a bent ice pick, or a stiff piece of wire bent 90 degrees to remove the flax. This is a directory of Boat Salvage Yards by State in the US plus some overseas Businesses. These are Businesses which will come and help you dispose of a boat. Each has their own way of doing things so call for Information. Boat Salvage yards operate in a variety of ways. Many charge to take boats away or will pay cash for the boat depending on condition, value etc. They can scrap the boat by removing all the useful hardware and the dispose of the hull, or they may sell the boat on. The following articles describe the various systems available to handle sails without having to or reduce the amount of manual labor required to handle them. These systems make it easy to raise lower and reef the sail . First up are Lazy Jacks which are the cheapest and easiest method of handling a mainsail. The Lazy Jacks sail system is a method of containing the main sail when its lowered or during reefing. 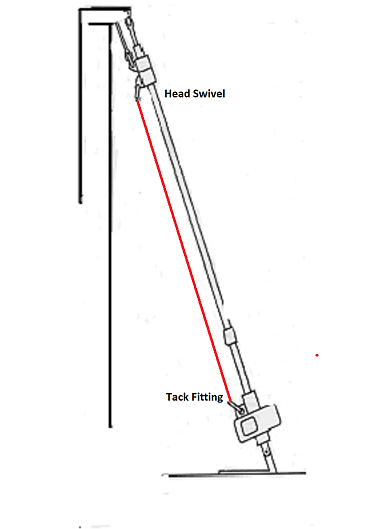 Lazy jacks are the simplest and cheapest mainsail handling system available. The Lazy Jack lines are installed either side of the mainsail; attached high up in the mast and down to either side of the boom. Since the jacks are either side of the mainsail it can be dropped and is captured between the lines. Lazy Jacks will not flake the sail neatly as the Dutchman system does but it will hold the sail on the boom. 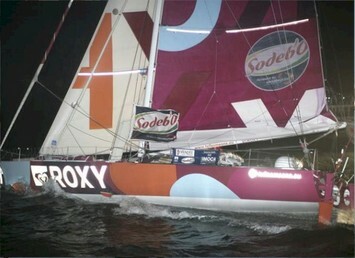 The picture shows Roxy finishing the Vendee Globe race and you can see the lazy jacks attached to a white cover along the length of the boom. These Sailors choose Lazy jack systems over Dutchman due to the extreme conditions they sail in. If the mainsail gets blown around the vertical lazy jacks capture the sail. The difference between Lazy Jacks and the Dutchman system is the lines of a Lazy Jack system are positioned either side of the mainsail, while the Dutchman line goes through the sail. The mainsail is stowed between the Lazy Jacks. The Lazy Jacks lines capture or cradle the mainsail as it drops. Lazy Jacks will work with a mainsail with a bolt rope, while the Dutchman system needs slides. 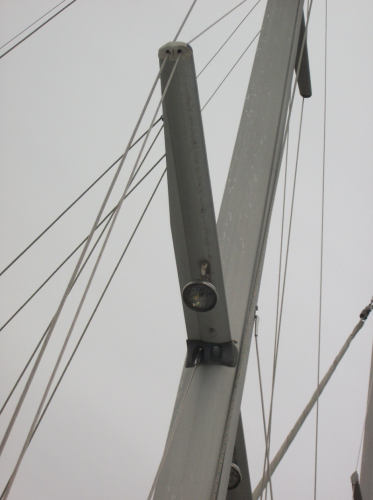 The lazy jacks are attached to the mast with pop rivets or screws and the same at the bottom end . This process is relatively cheap and fast although you will need to go aloft. With a Dutchman system when you are reefing or dropping the mainsail in heavy wind conditions the Dutchman filament lines drag on the discs and that may prevent the sail dropping easily. This is why the Vendee round the world racers use Lazy jacks. The lazy jacks start with one line mounted high up on the mast. This one line then splits in to two more lines and its possible to make as many legs as you need. The simplest system has just one top leg and splits into two bottom legs. You can ad more bottom legs as required for larger mainsails. The 60 foot long Vendee Globe boats like Roxy and PRB have 3 legs which split into 7 legs for the very long boom they have. You can add as many legs as you like, but I would follow the boat manufacturers recommendation. The best results with Lazy Jacks is by using full length battens. Short or regular batters end up getting caught in the Lazy jack lines. With full length battens the mainsail folds down in a stiff manner in between the lines and does not flop around. When you hoist the mainsail and its fully raised the lazy jack lines should have some slack in them. The slack allows the mainsail to set properly. 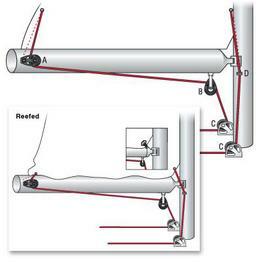 The Harken Diagram, shows the lazy Jack legs being held outboard at the spreaders, which helps separate the sail, from the Lazy Jack Legs. The boom cover will need to be modified unless you pull the Lazy Jack line lined forward after the sail has been dropped and secured. The modification includes slits and zippers or Velcro where the Lazy Jack Lines attach to the boom. If you combine the Lazy Jack system with a mainsail luff track and slide system, the front of the sail may flake itself somewhat, and then you can tidy up later. In the case of the vendee Globe boats the lazy jacks are attached not directly to the boom but to canvas which is in turn attached to the boom. 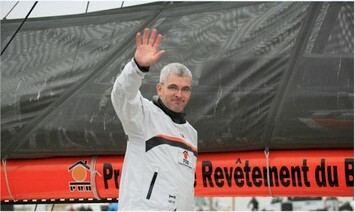 This picture of PRB, shows how the canvas captures the huge mainsail on these boats. Stack packs are versions of this concept. It is quite feasible for you to make your own Lazy Jack system, many do. However buying a pre made kit takes some of the time out of the project. Harken and Schaefer are two of the manufacturers for lazy Jacks. The Schaefer system is a bit more expensive, but has a feature allowing the lazy Jacks to be pulled forward which removes the need for boom cover modification. Each have sizes based on boats length from 21ft to 48 ft. Both are available through the links below. Most of marine stores have ready to go Lazy jack systems. All you need to do is install the legs, all the lines blocks and cleats are provided. The Ezjacks system lets you pull the lazy jack lines forward. This enables you to use your existing mainsail cover. Otherwise you will need to modify you main cover with slits where the lower legs meet the boom. USCG requirements mandate boats carry the following equipment. Link to the USCG requirements for required safety gear. The USCG may board your vessel to check your equipment so check to see you have the correct gear and that fire extinguishers are not out of date. Its not just carrying the right equipment it’s also handling your boat safely. One approved Type I, II, III or V (must be worn) PFD for each person on board or being towed on water skis, tubes, etc. Every vessel 39.4 ft (12 meters) or larger in length must carry a whistle or horn and a bell. The whistle must be audible for 1/2 nautical mile. The mouth of the bell must be at least 7.87 inches (200mm) in diameter. Every vessel less than 39.4 ft (12 meters) in length must carry an efficient sound producing device. However you do not need to carry a bell if you are operating on international waters. All boats over 16 ft, Must carry approved visual distress signals for both daytime and night-time use. All boats under 16 ft, Required to carry approved visual distress signals for night-time use. Coats Guard require 3 day and 3 night signals. This Boat safe diagram will provide you with a full description of all the available types of visual distress signals (VDS) for inland waterways and international waters. Shelf life of flares; Note it is important to check dates for flares and rockets and smoke signals as these will be checked by the coast guard, plus its for your safety, Pyrotechnics have a shelf life of 42 months. 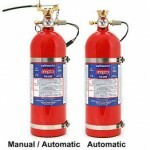 Boats 26ft to 40ft: Two B-I type OR one B-II type approved portable fire extinguishers. If a fixed fire extinguishing system is installed in engine and machinery rooms, it will replace one B-I portable fire extinguisher. (For Boats built after 8/1/80) They must have at least two ventilation ducts capable of efficiently ventilating every closed compartment that contain gasoline machinery and fuel tanks, except those having installed tanks which vent outside of the boat and do not contain electrical equipment. Engine compartments containing a gasoline engine with a cranking motor are additionally required to contain power operated exhaust blowers which can be controlled from the instrument panel. (For Boats built before 8/1/80) They must have at least two ventilation ducts fitted with cowls for the purpose of efficiently and properly ventilating the bilges of every closed engine and fuel tank compartment using gasoline as fuel or other fuels having a flashpoint of 110 degrees or less. Back-fire Flame Arrestor. One approved device on each carburetor of all gasoline engines installed after April 25, 1940, except outboard motors. Carry either State registration or documentation papers. Since 9-11, the U.S. Coast Guard can ask you to produce a pictured identification card, such as a drivers license. If you are going to be afloat after sundown then you will need Navigation lights. Masthead light – 3 miles. Sidelight and stern light – 2 miles. All round lights – 2 miles. These are the regulations for the UK and USA as provided by Power Boat Training and the USCG. The skipper of the boat is responsible for all onboard; therefore you should not rest on what the USCG says you need for safety. there are many more items we could add. When boarded safety inspection, failure to produce any of the above equipment could result in fine and/or termination of your voyage. Make sure your safety equipment is in good working condition. Some states require more than list list so check for your states requirements. 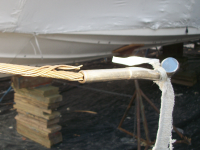 This Mast Boot is from Windblown products and is a self amalgamating Tape. 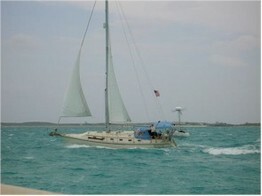 Jay Herman developed this product using his extensive knowledge Rigging Cruising and Racing Sailboats over 30 years. Due to the variety of mast partners and mast sections to deal with Jay sought out a tape that would bond to itself and to the mast and deck. He ended up with this self amalgamating 5 inch wide rubber tape. the tape is very easily applied and will provide a complete waterproof seal to your mast partners in one application. Unlike hard plastic mast boots, this self amalgamating tape can fit any mast size.The tape which is a wide 5 inches seals to the mast partners and to the mast and to itself, providing a complete seal, without needing hose clamps, glue or Duct tape. There are no hard and fast times to replace your boats standing rigging, so regular inspection will help you know when to replace any stays. At the end of the season a thorough check leaves you time to make changes, while a quick check at the beginning of the season for clevis pins cotter pins etc. makes sure your rig is secure. During an inspection you find a shroud which has some issues. This observation becomes a concern and you inspect other parts of the rig and you see a couple of problems. How do we go about fixing any problems. The answer is it depends on the damage. If the swage is cracked or the wire frayed, and the turnbuckle is OK, then you could just replace the wire. If the damage is local to the swage fitting or its cracked you could cut it off and replace with a swageless fitting with a extra long stud. For the DIY enthusiast this is a simple operation. If just the turnbuckle is damaged this may be all that needs replacing. If the wire and the fitting is damaged the whole shroud should be replaced. This may be one shroud or the whole set of stays. Whichever it is well look at how to do this. Once you have figured out what you are replacing, the next step is how. 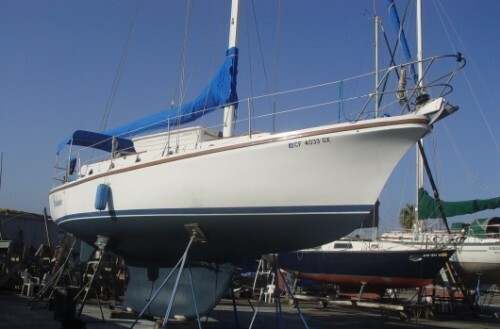 To do this it’s best to have the mast pulled during the winter or any downtime. If you remove the shrouds and send them to a rigger it’s almost unnecessary to do much more, as the rigger will be able to reproduce. If they have any questions they can ask for additional details. Measure rigging and order replacement for swapping out old for new at a later time. If you measure the rigging and send dimensions to a rigger for them to build replacements, this involves a lot more knowledge plus measuring in situ can be problematic. Swageless fittings allows a boat owner to replace stays himself. You can replace one shroud at a time or if the mast is removed you can pull all the shrouds at one time. Clevis Pin diameter; these are sized to wire diameter. 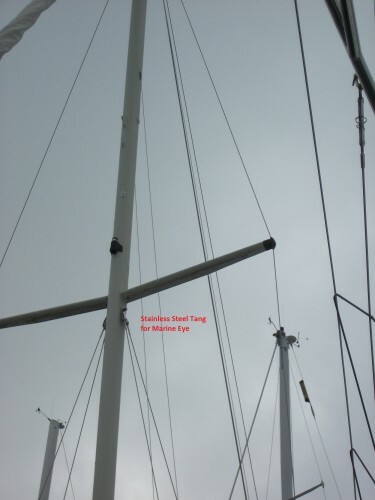 Tangs and backing plates; if you replacing shrouds make sure you have information on the existing mast tangs and plates so you can match to new fittings. Some T-Terminals are no longer made and new ones may have a different shape and the Gibb style T-ball may not fit into those backing plates. 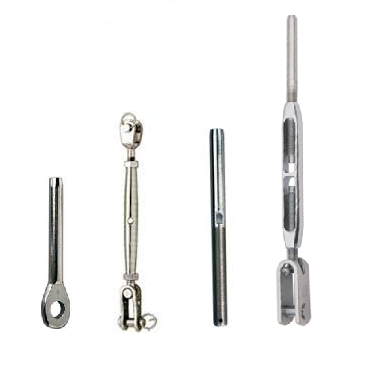 For these fittings you need wire diameter, clevis pin diameter, turnbuckle Stud diameter, and thread direction. Note for a given wire size the thread could have 3 diameters. For example ¼ wire fittings can have a 3/8, 7/16 or ½ inch diameter. What sizes do you need; pin to pin dimensions, the wire size, terminal identification and terminal pin size are important. Some riggers use the pin centre as the definition of one end, other use the bearing point. To measure a shroud, bang a nail into a suitable surface. Hang the shroud terminal on the nail and then hook the measuring tape on the same nail. Stretch out the shroud and tape, puling tight. If you are making a whole new shroud you should measure the old stay and then when making the new one set the turnbuckle 2/3 open. 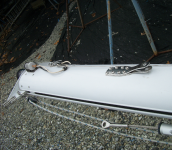 With the turnbuckle 2/3 open, you have enough room to tighten the stay once the mast is stepped. Rigging stretches so the extra length to tighten the stay will be very beneficial. This 2/3 open is an Industry standard although some may set them at 1/2 open. One advantage of swageless terminals is they can be made by the DIY boater. where the wire ends inside the fittings. The distance between the two lines is how much can be gained by using a long swageless fitting. If you have the damage to wire and the damage is limited to 2 inches or less from the swage fitting then it’s possible to cut off the swage fitting and replace with a swageless fitting with a long stud. Lets see how this works in practice with 1/4 inch wire. For this we need to look at the specs for normal and long fittings. The difference between c and b is what can be gained in length (diag B). C-B = 2.44 inches which is the distance gained by using an extra long fitting. Link to Noresman specs gives us the dimensions of B and C in the diagram B. 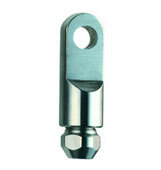 An alternative to Swage Rigging Terminals are swageless terminals also called mechanical terminals. The beauty of the Swageless fitting is it does not require specialized tools. All you need is a method of cutting the wire to length and then 2 wrenches. 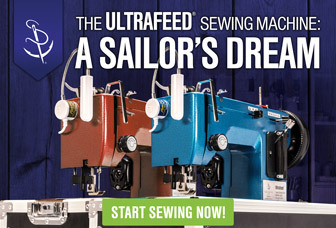 This makes them perfect for the DIY boater. This can save costs and in some cases you can make a shroud in an emergency when no swage machine is available. 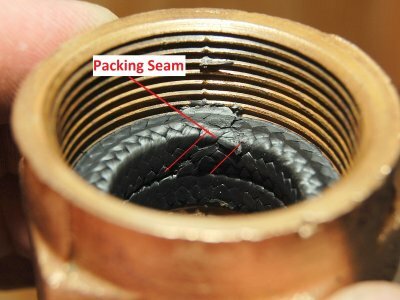 How do Swageless fittings work? 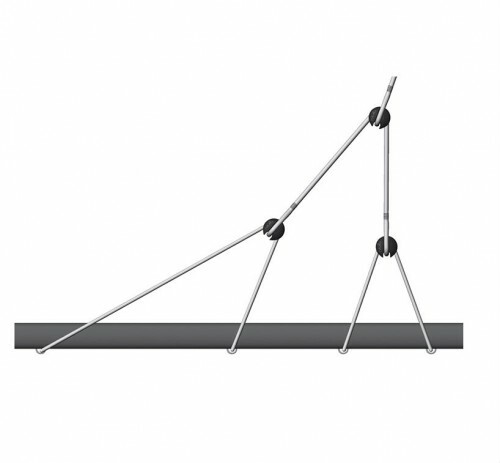 Standing rigging is normally made from 1* 19 wire which has an outer layer and inner layers of wire (19 wires in total). Swageless rigging terminals do not rely on crushing the wire into a hollow fitting like a swage fitting they have a mechanical grip. Swageless fittings work by trapping the wires between the body of the fitting and the cone which is position in between the wires outer and inner layers. When the body is screwed into the eye the individual wires are locked in tight and when shroud tension is applied the cone is pulled tighter into the body therefore increasing the grip. First find the end of the wire and then slide the body of the fitting over it. Once cone is in place carefully twist wires back together. They should look like ‘a” in the drawing. Screw down eye and tighten using 2 wrenches. Locktite is used to stop the eye unscrewing. From this you can see the cost of a swageless fitting is quite a bit more and in the case of the Hi-Mod terminals over twice the cost. However if you are willing to make a shroud yourself you will save the riggers cost. One Company I found posted the charge for a swage for wire sizes 5/16″ to 1/2 ” to be $24. Therefore the true cost of a marine eye is $34 + $24 = $58 about the same as the Noresman fitting. So quite possibly the Swageless shroud will cost less than a Shroud made with Swaged fittings from your rigger. Sta-Lok Swageless Fittings Sta-Lok the reusable alternative to swage. Easy to install. Only basic hand tools required. Guaranteed stronger than wire rope. For right hand and left hand lay wire rope. Packed for 1×19 wire as standard. Different wedges are available to terminate 7 strand and compacted wire ropes. 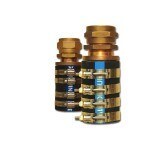 Norseman Swageless Terminals Norseman terminals provide a completely secure end fitting. The standard terminal can be used on 1×19 strand, 1×19 Dyform and 7-strand rope, using the appropriate cones. They are approved by Lloyd’s Register of Shipping. 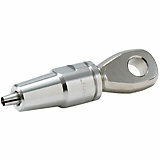 Hayn Hi Mod Swageless terminals Produced by Petersen Stainless Rigging and distributed by Hayn Marine in the USA. Hi-MOD terminals have a unique crown ring that assures the wires stay evenly spaced around the fitting, eliminating the need to bend the wires, assures the cone is in the proper place, and keeps the strands from dropping into the cone slot. 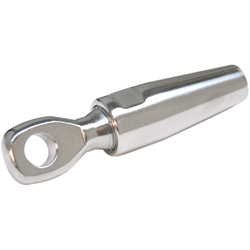 As with swage terminals, swageless terminals are available with a variety of different attachment methods; eyes forks, toggles and threaded studs (for insertion in a turnbuckle barrel). These fittings are used to connect wire rigging to mast and chainplates. When purchasing swageless fittings match the wire lay to the thread i.e. either right hand or left hand thread. Both Rigs have all fittings, spreaders, Goosenecks, sheaves, and assorted hardware. The booms have paint on them, they are white. Annapolis Rigging posted the above ad and a buyer came from Denmark. So how do you ship a big Mast & Mizzen to Denmark? The rig will go on a ship leaving Baltimore going to Rotterdam. From there it will go by truck to Denmark and the new Owners home. The mast sold for $9,000. 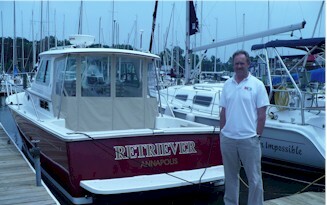 The buyer sent Annapolis Rigging a 50% deposit to secure the sale and to have the shipping crate built. The remaining 50% transferred when the truck picked up the mast. The buyer arranged for the shipping and knew the trucks schedule and the ships schedule. The buyer paid for shipping directly. This 78 foot by 2ft by 2ft crate contains a main mast, mizzen mast, booms, rod rigging and many parts. 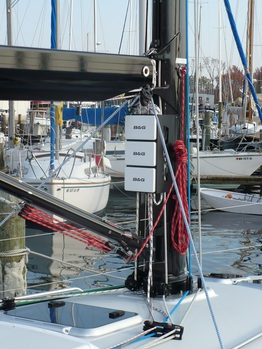 The box is mostly for protection and storage, while the masts themselves offer the structural rigidity. The crate will have two well marked designated lifting points as this package is very heavy. When the box was lifted it weighed 3,500 lbs, measured by two load cells. What is most important when prepping for the winter can be summed up by conditions. If it is going to freeze, winterizing the engine and any systems that have water in them, is the absolute minimum you will need to do. Any trace of water can cause havoc whether in an engine, toilet, bilge, outboard, air conditioning or running water systems. If you have the space it is recommended that you remove as much ancillary gear from the boat. This stops the gear from getting cold damp and helps air move around the boat. It also stops certain items getting stolen. Check your insurance policy.If you are having the boat pulled for the winter, most of the winterizing can be done in the water. The engine may be needed to get to the lift so that can be done onshore and engine mechanics have the tools to winterize on land. Below is a fairly comprehensive list of projects that will help you in the spring. These are fairly general projects. If you are unsure about a particular system you should consult an expert at your boatyard. 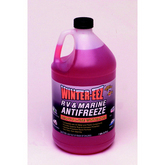 Marine antifreeze comes in three different temperatures, -50, -60 and -100. At these temperatures the antifreeze will solidify. Glycol content increases from 30% for -50 to 60% for -100. Propylene Glycol is more environmentally friendly. Do not use automotive type antifreeze, as they are toxic. Captain Johns Boat Brite is for removing staining from fiberglass hulls caused by algae and brackish water. It works by spraying the Algae & Waterline Stain Remover onto the fiberglass surface, then just after a few seconds, simply wipe stain away then rinse with water. 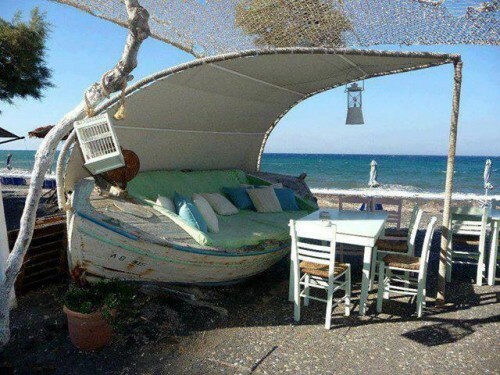 The picture is of a boat which is dry sailed but had been sitting in the water for a weekend. You can clearly see the staining from the brackish water, with a cleaned area in contrast to the stained fiberglass. 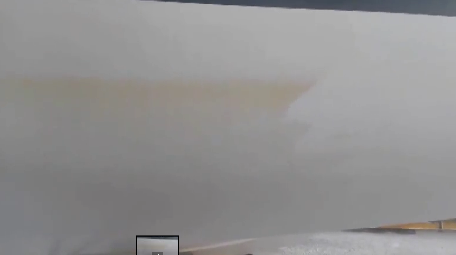 Watch the following video of this hull being cleaned. 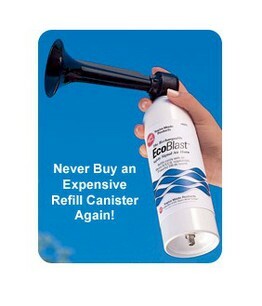 Boat Brite is expensive at $20 for 32oz, but works quickly and your conscience is clean. Boat Brite waterline Stain Remover may streak antifouling paint but will not remove paint or compromise its performance. Captain John’s Boat Brite Algae and Waterline Stain Remover does removed wax, so following with a quick cleaner-wax will help keep the stains from coming back quickly. There are many reasons to put a roller furler systems on your boat. Convenience is the big one, to be able to set the sail and loose it quickly and without having to leave the cockpit is huge. Storage is another, you do not have to put the sail in a locker, saving space. Whatever your reason for wanting a roller furler this article attempts to help your decision, by presenting each furler and their features. We take a look at some of the most popular manufacturers of reefing systems and roller furling equipment, such as Harken, ProFurl, Schaefer, Reckmann etc. We looked around and there is not much in the way of Roller Furler reviews, so we have attempt to give you an idea of how each one is different, what you should look for when choosing a furler and a price comparison. 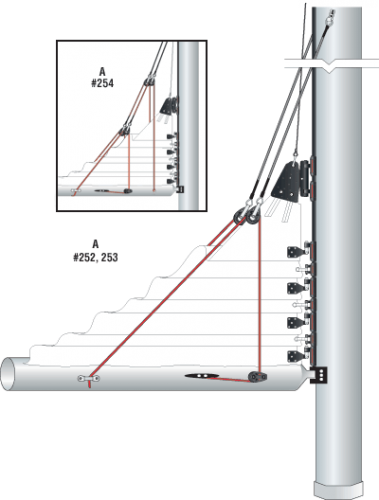 Apart from issues in deciding which furler unit you need, we also discuss other aspects. Roller furlers are like any piece of mechanical equipment, they do come with issues that should be addressed. Then you know that its going to work, and not jam up when you least need it to. Also when using roller furling there are some considerations for your sail to get the best shape and life out of it. Most traditional furlers use solid extrusions for the luff of the sail. The Foil sections can be aluminum, carbon or plastic. Simply pull the line on the furling drum and the foil turns. The sail attached to the foil is wrapped around the foil as it turns and is wrapped evenly from top to bottom. The Code Zero Furler is for a Code Zero or Gennaker, (cross between a Genoa and asymmetrical spinnaker). 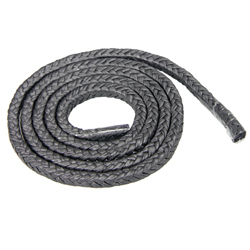 The Code Zero has a rope luff built into the sail, which is a torsion rope. This torsion (anti twist) rope transmits the furling of the lower drum to the top swivel. As the furling drum turns the top swivel turns almost at the same time. The Code Zero requires very high luff tension. You need to work with the sailmaker to get the torsion rope built into the luff. Link to Karver Code Zero Furler. The Top Down furler is intended for Asymmetrical spinnakers. The reason for the name is the furling process. Because the sail is only attached to the top furler, (floats loosely on the bottom drum) it is only this part which gets wrapped when the furler line is pulled. As the furler turns, more and more of the sail gets wrapped around the rope luff and does so from the top down, hence the term, “Top Down furler”. This furler works well for spinnakers and sails that are set with a loose luff. The top down furler is an alternative to the Snuffer. No modification to the spinnaker is needed. For cruisers a Jib or Genoa works best with the solid luff extrusion furler, which we are discussing below. Find out what type what arrangement and how many bearings there are with a system. Torlon is preferred Schaefer, Hood, and Harken use Torlon bearings. Furlex Rondal and Reckmann use stainless steel bearings. Profurl uses carbon steel bearings which are housed in a lip seal. The issue here is if the seal gets worn through or damaged corrosion will occur. There are various shapes of extrusion round or airfoil. Round is better for furling as it rolls the sail evenly. Airfoil or oval shapes are best for racing. Airfoils sections are usually lighter with thin wall. Round sections like Schaefer are very thick walled and heavy. You also have twin groove for racing. Some are plastic lined, others use screws or rivets. Its important that the extrusions do not come apart, as furlers are subjected to years of rattling which can undo even well seated screws. Screwed systems need to use Locktite to stop them coming out. Harken MkIV, Schaefer and Profurl use your existing headstay so you can use them with a turnbuckle or not. Harken MKIII uses a turnbuckle body built into the furler drum and so some modification is necessary. 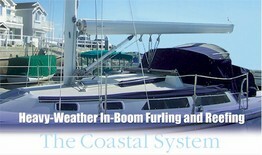 With Furlex you get a new headstay w choice of (turnbuckle) rigging screw or not. A fully rotating tack swivel allows the sail to Furl from the middle first, which results in taking shape out of the sail. Furled sails tend to be quite baggy and so flattening helps. See also the section on sail shapes below. Furlex has what they call turn free. This means the tack swivel turns almost 1 turn and then stops. The reason for this is the Hood Patent on the fully swiveling tack. 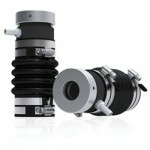 larger drum diameters mean more leverage which reduces the load on the furling line. Harken MKIV has a better drum diameter to foil size than the MKIII which is one of its improvements. Materials used include, injection molded plastic, cast aluminum, machined aluminum, investment cast Stainless Steel. Machined aluminum is best say for the halyard swivel. Its very important to have toggles at top and bottom end of extrusion to allow for the sag of the headstay.